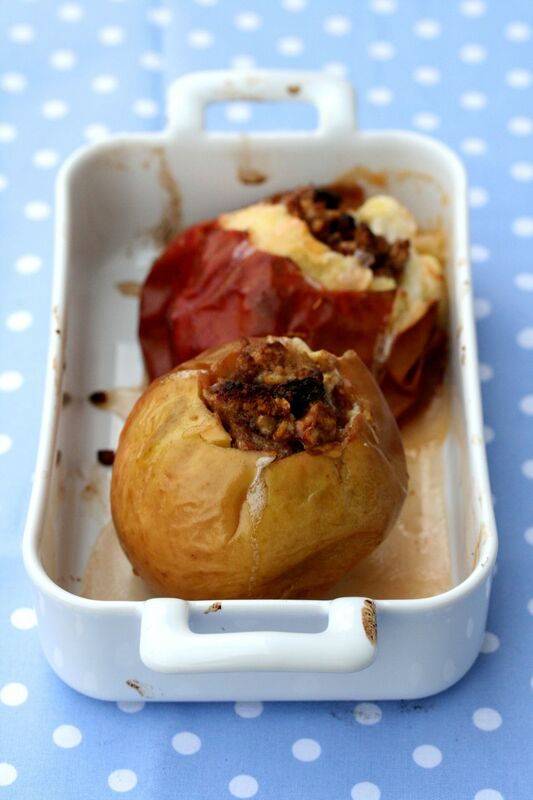 German baked apples or Bratapfeln are a common treat when the weather turns colder. Christmas and winter would not be the same without the smell of apples baking in the oven after returning from a long walk through the woods or a day of sledding. This easy dessert, which also can be eaten as a sweet main dish, is a traditional German offering when the temperatures drop. Often, they form the backbone of a baked-apple party, because they're inexpensive and so easy to make. Variations abound, but the most common is made, simply, with sugar and butter, raisins and nuts. Elevate this baked apples recipe to a gift from the gods with the addition of vanilla sauce for a delicious dessert. The Belle de Boskoop apple variety, originally from the Netherlands, is traditionally used, but any other pie apple will work fine. Core apples (or cut into quarters, core and put back together). Mix butter and sugar, add raisins and walnuts. Pack filling into hollowed-out apples. Place in buttered baking dish and cover with lid or aluminum foil. Bake for 45 minutes to 1 hour or until the tip of a thin knife can easily pierce the apple. Serve on plates and drizzle the caramelized pan juices over the apples. You also may want to serve these apples with warm vanilla sauce. In a medium heatproof bowl, beat together the egg yolks, 1/2 cup sugar and 1 tablespoon vanilla sugar (if you are using vanilla extract instead of vanilla sugar, it will be added later) until the yolks are thick and pale yellow and the sugar is dissolved, about 4 minutes. In a heavy-bottomed 2-quart saucepan, bring the 2 cups of milk to a boil. Pour the hot milk slowly and in a thin stream over the egg yolk mixture, whisking continuously by hand or with an electric mixer. Pour the tempered egg-yolks back into the saucepan and heat without boiling until mixture coats the back of a spoon. Remove pan from heat and stir in the vanilla extract, if you are using it instead of the vanilla sugar. Serve warm or cold. You might want to cook the egg yolk-milk mixture in a double boiler, which heats gently and will help to prevent the sauce from curdling.